You can tell it’s warm when the locals take off their winter coats and only wear a light jumper. Today is 34 degrees. After spending 2 hours outside, I am tomato faced and burnt. If all else fails, there will always be one constant in this world: I will get burnt as soon as I see the sun. 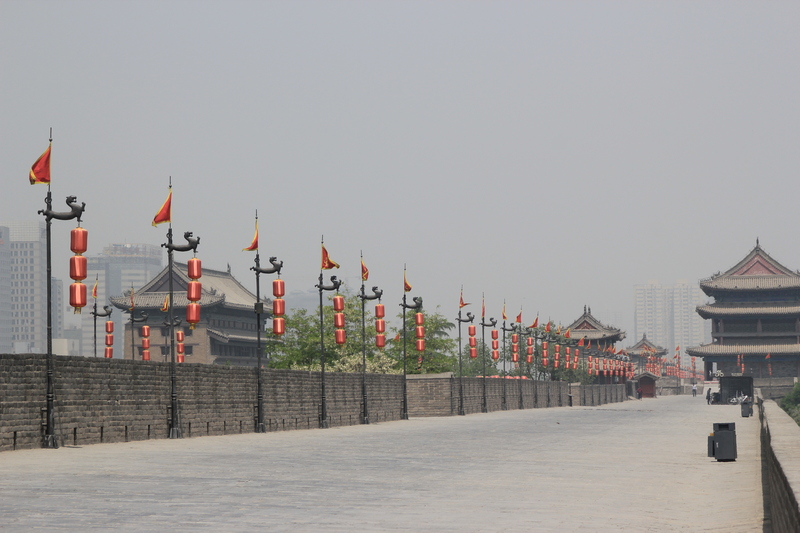 Xi’an city wall was built during the Ming dynasty in the beginning of the 14th century. 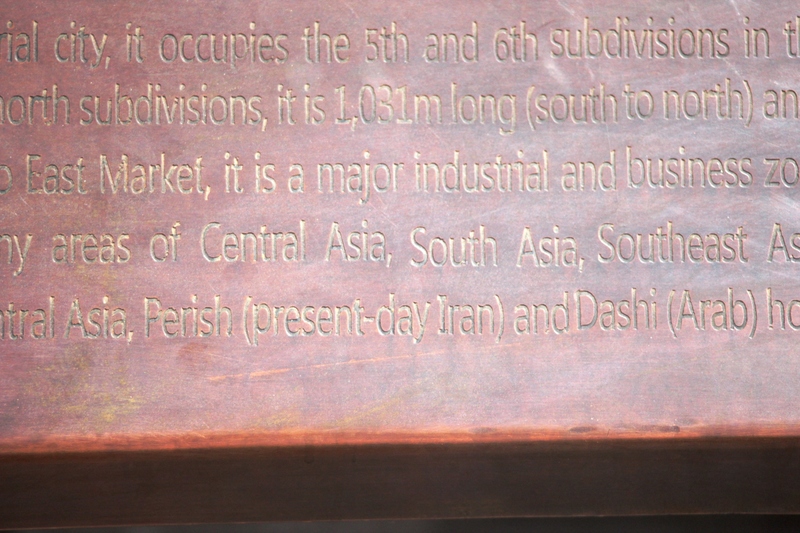 It’s about 14 km long and the south-west corner of the wall is considered the start of the Silk Road. 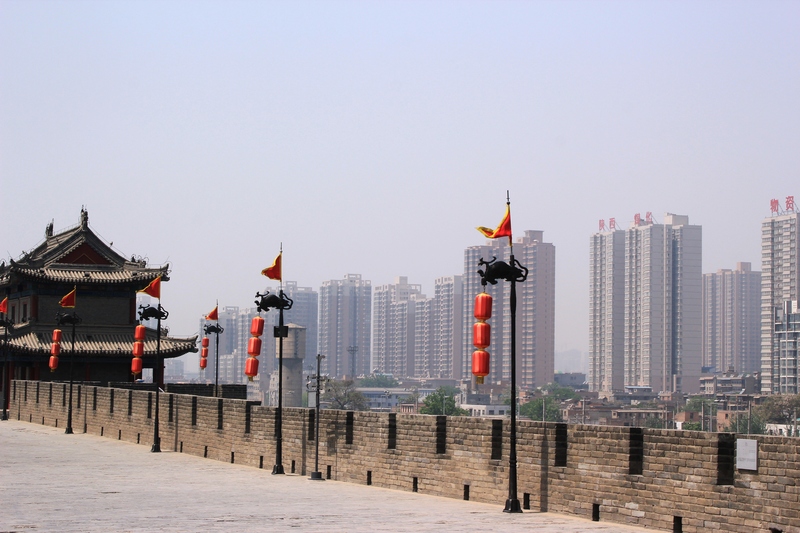 Most of the buildings inside the city walls retain their Chinese characteristics and are complete with the curved roofs and rooftop gardens. The area inside the wall is not huge, but it’s very packed with houses and people. David and I were wondering why this may be and came to the conclusion that back in the day when the walls were built it was probably safer for the people and easier for the emperor to have all his people in a small area. You think England doesn’t have enough space? 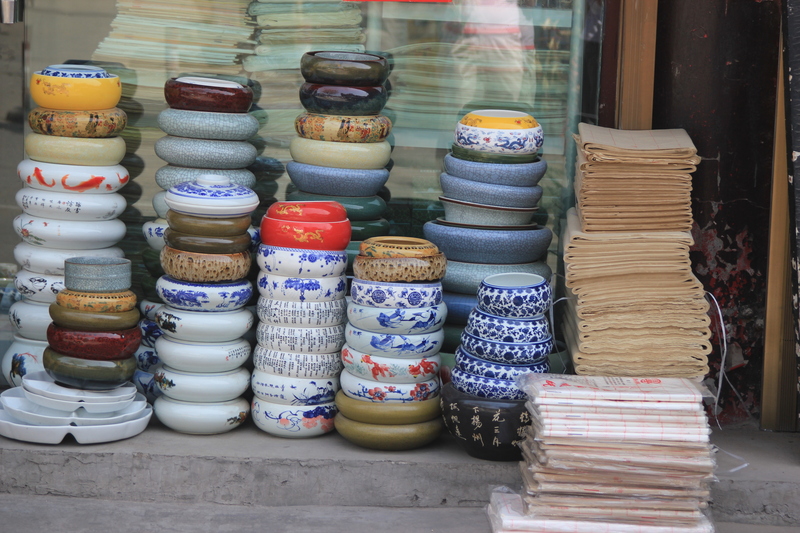 The contrasts of new and old China are very obvious looking from the walls. 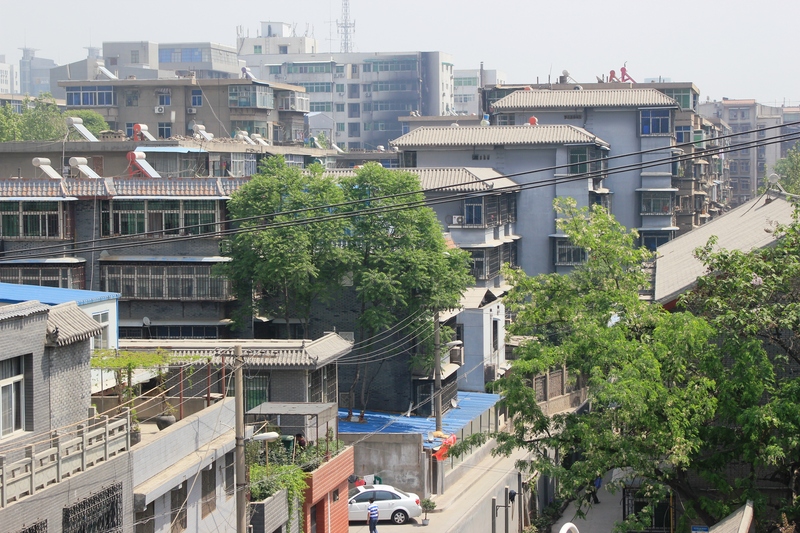 Outside the walls are the high rise apartment buildings, where the majority live in tiny apartments. 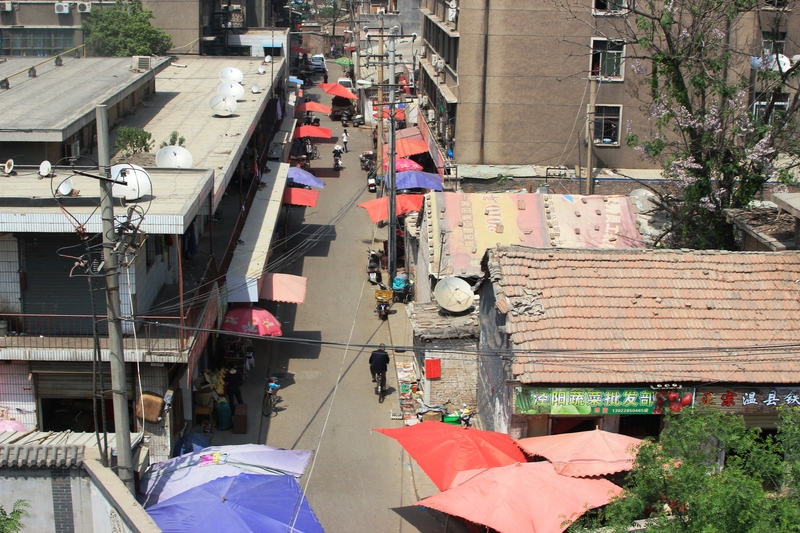 Inside the walls is the Muslim quarter, lots of fancy shopping malls and the old part of town. It was nice to see people going about their daily business as we rode our bike (David did most of the cycling, I am, after all, a lady of leisure in my leisure time). 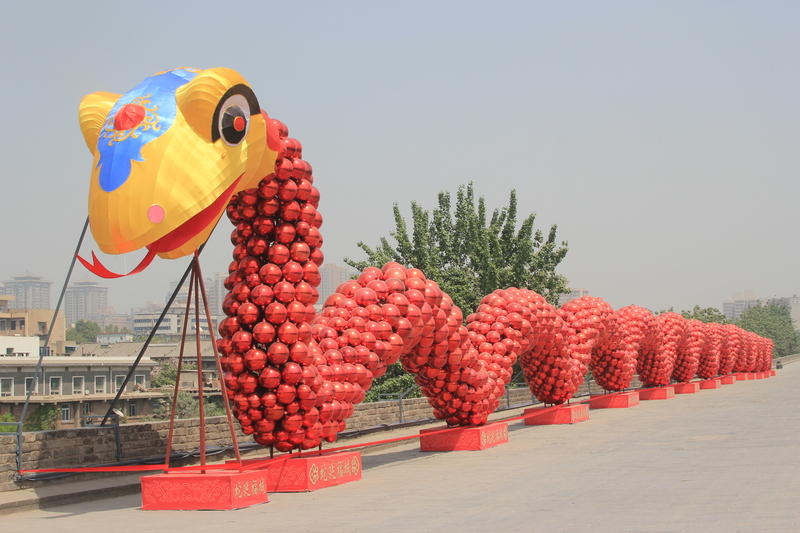 Year of the snake decoration on the wall. 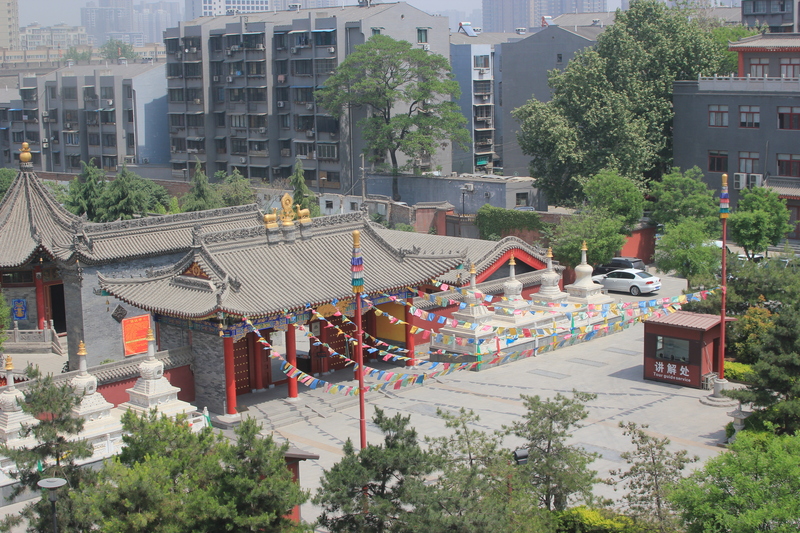 A temple by the north gate. A guy preparing lunch at his home. I’m not sure what to make of the city walls. They are impressive, but I don’t think I will be going back there in a hurry. It’s nice to peek down at people mingling in the streets, but it’s much more fun being part of the mingling! Yes, we do have a whole area dedicated to the art of writing. 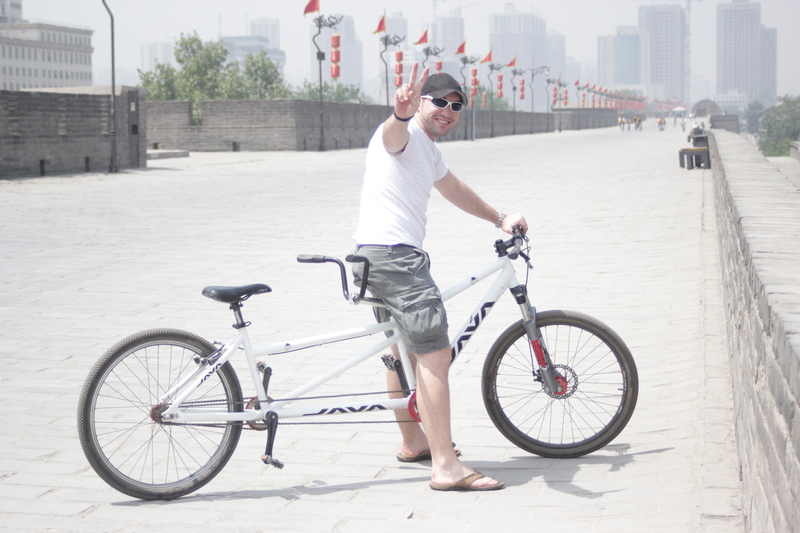 We went for a walk there after cycling the wall. I love the art area, even though parts of it are very touristy. 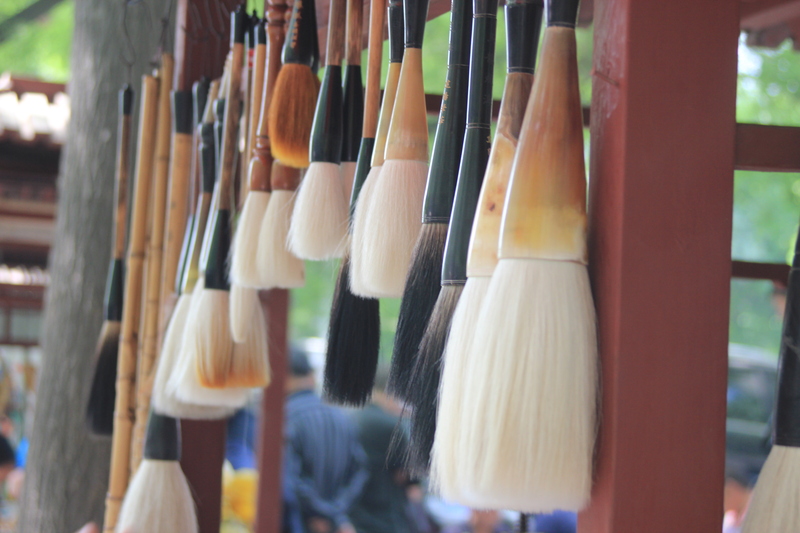 You can find some amazing examples of calligraphy and traditional Chinese painting, tea sets, jade jewellery, all sorts of back – ear – and toe scratching devices made of animal bones and a bit of tacky rubbish. Bowls for rinsing your brush and for your paint lots of paper. It’s my plan to go shopping there before we leave China. Most of the art is handmade right there, but there are some dodgy items that look like they’ve been produced by millions in a factory somewhere. 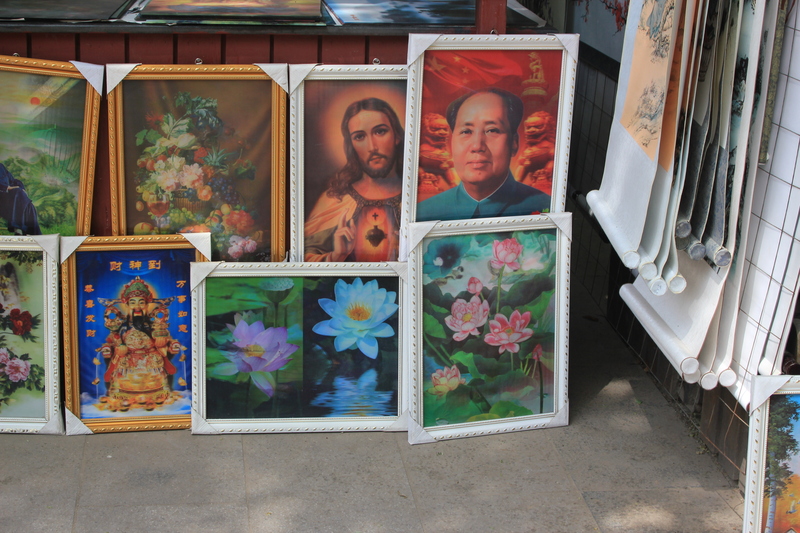 Chairman Mao, Jesus, lotus flowers…..catering for all tastes here! 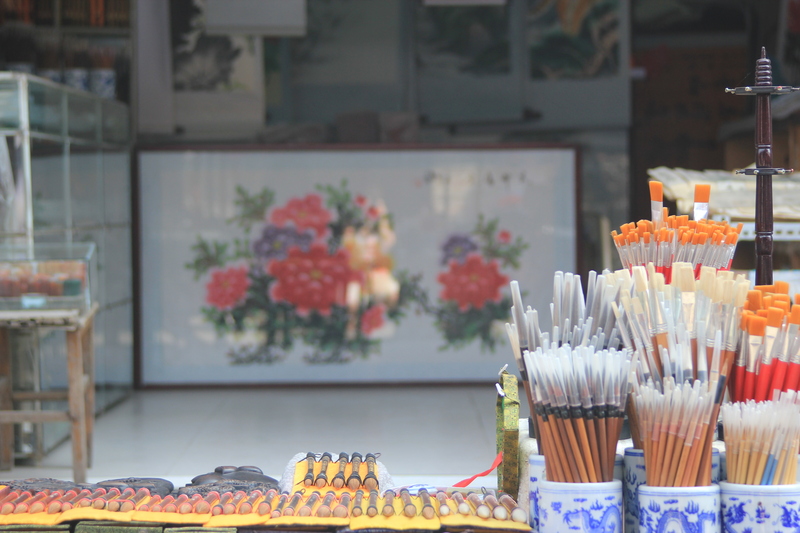 This area is in the city walls and so the buildings around are also traditional Chinese courtyard buildings decorated with ornaments and paintings. Despite being a walking only street there are motorbikes and the occasional car on the road, which makes the place quite chaotic. But it’s not the crazy nerve-wracking chaotic, it’s more like atmospheric-chaotic. I found this temple across the road from my office. By a temple I mean an area of land covered by many small temples. It’s so well hidden you wouldn’t know it’s there. 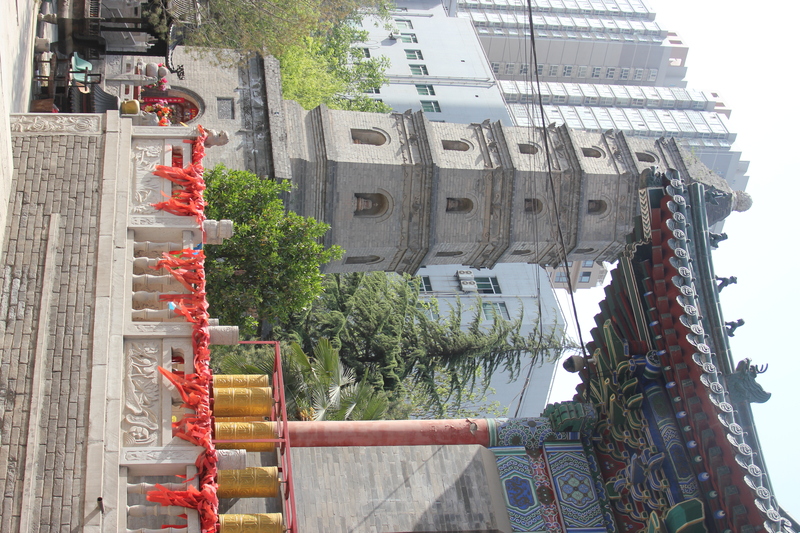 This temple is famous for its hell shrines. I was advised not to take photos in them as it would be impolite, but I can describe it. 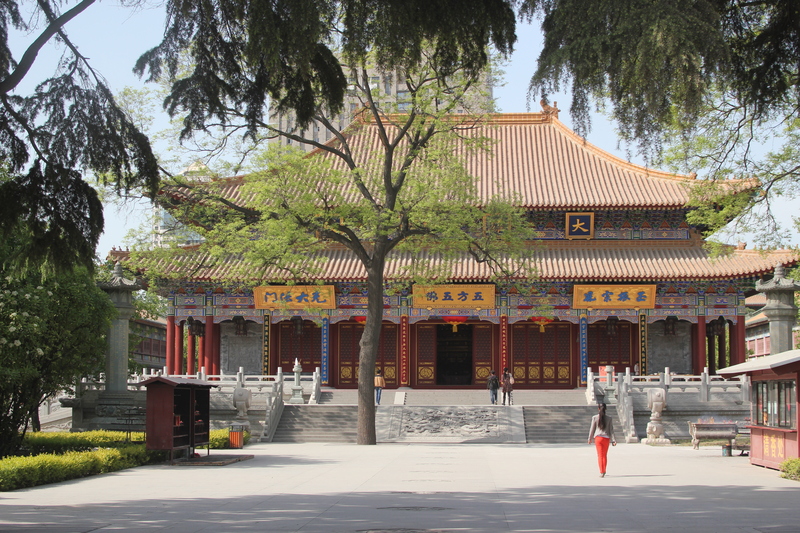 Chinese people go in these hell temples to pray for their loved ones and for good health (as they do in most temples). Inside this temple is meant to look like Naraka or purgatory for us. It has many levels, also like purgatory. However, people don’t go to Naraka as a result of a divine judgement, but they are born into it. So if you live your life in a very bad manner you will be reincarnated into Naraka. It’s not eternal – you have to collect enough good karma to get out of there. A temple from the outside. The scenes in this temple really scared me. They have created a very life-like room filled with statues of people having their eyes pecked out by birds, people being sewn in half, people’s tongues being cut off and so on. For me it was extremely strange to see such scary scenes in a holy place. I still don’t quite understand why it’s necessary to pray in such a chilling place. My Buddhist friends, your feedback is appreciated! After the hell temples we went to some other temples, which were pretty standard ones. 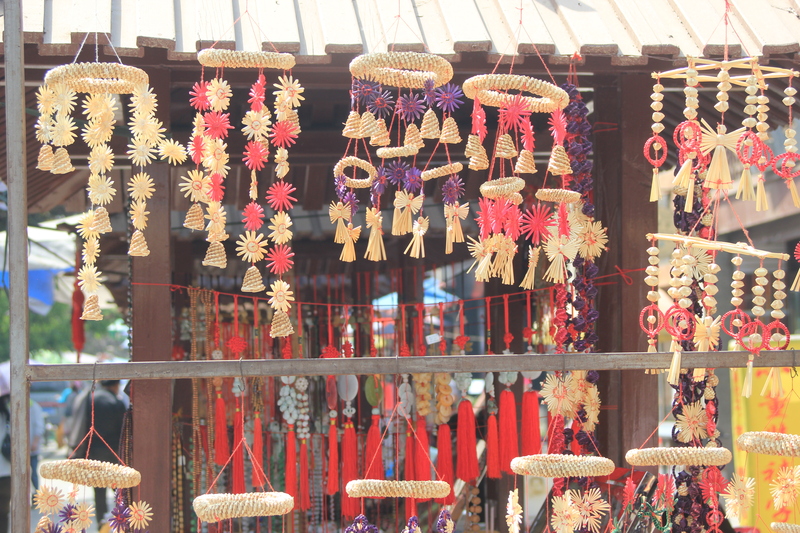 Lots of Buddha statues, people bringing gifts of fruit and flowers, burning incense and spinning prayer wheels. The place was very peaceful compared to the crazy streets just a 5 minute walk away. This temple has some monks living in it. 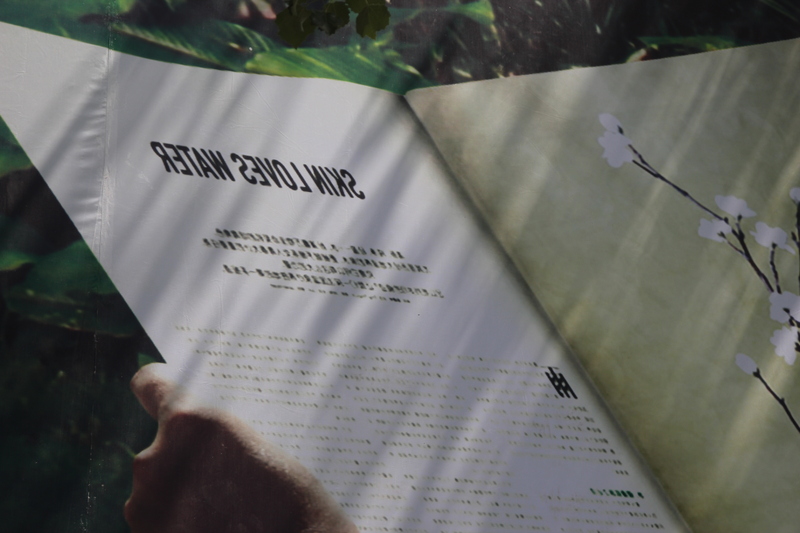 It was nice to see them going about their daily business, attending to their vegetable garden, reading their books and meditating. The monks save animals from the streets and restaurants that serve unusual food (donkey is normal!). 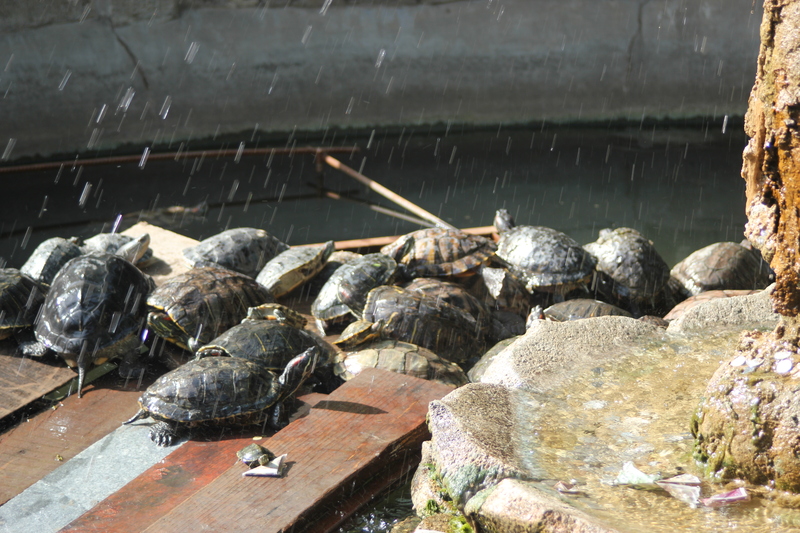 There were two whole pools filled with turtles saved from restaurants. I went with a Chinese friend and asked her how often she goes to the temple. She said she goes about twice a year. When I called her a Buddhist she said she was not one even though she believed in the Buddhist way of life. 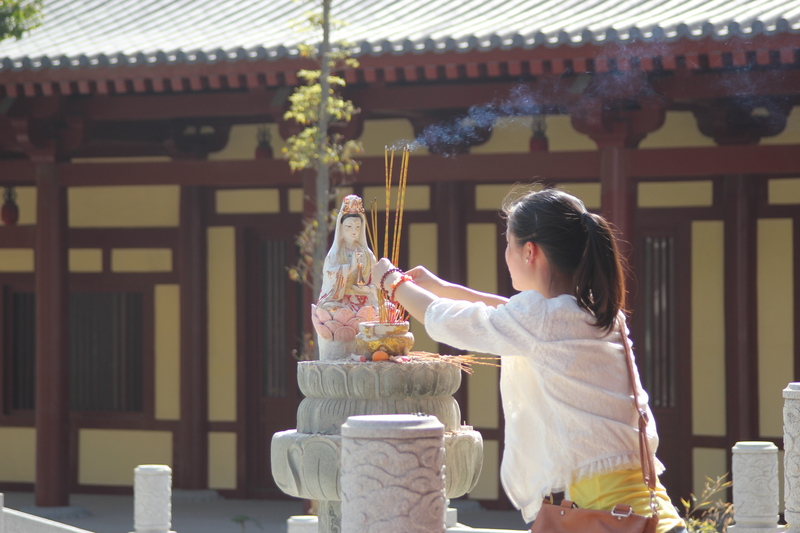 She said she had not gone through the rituals to become a Buddhist, so she cannot be one. Again, I’m not sure how true this is, it may be just her individual belief. She said people usually go to a temple when they need something or when they or a family member is sick. I think this is very similar to why a lot of people go to church. 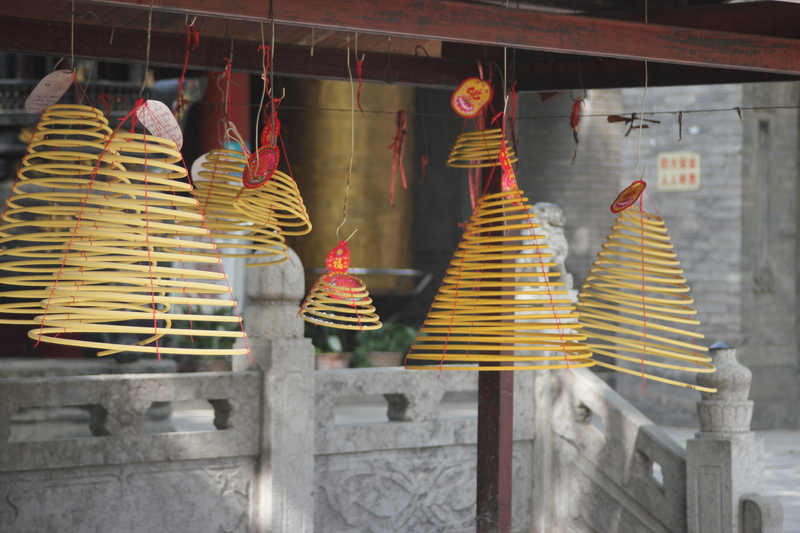 One should go back to the temple to thank the gods after a wish has been granted, but this does not always happen. Again, same as church. 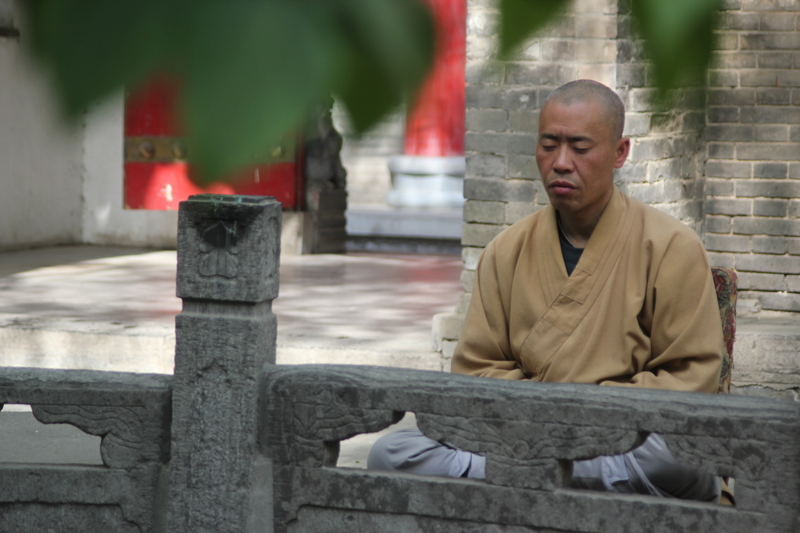 I do think Chinese people are spiritual, but I also think their spiritual world was turned upside down in the Mao era. I believe they want to get back to the peace that spirituality provides, however they now have a new distraction in all the material things they think they need. The more I think about it the more confused I get. We had donkey meat and it was delicious. 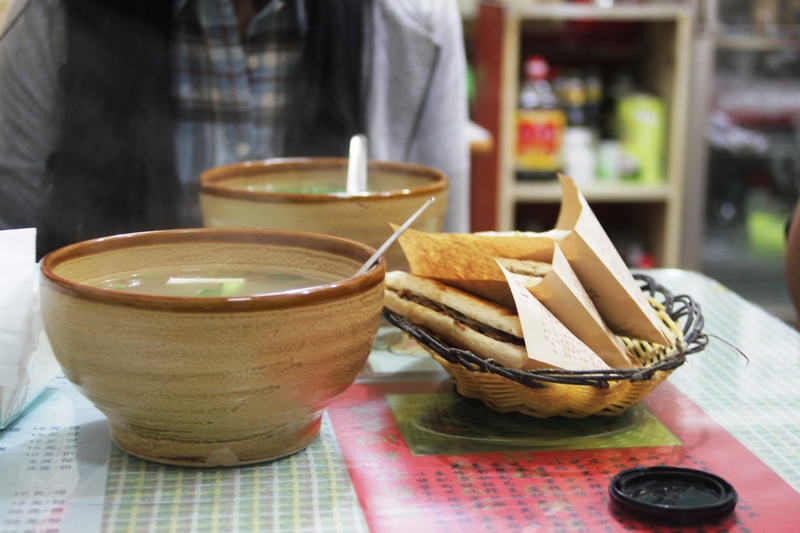 We had it in a soup with noodles made with sweet potato and with the soup we had a donkey meat sandwich. We were invited to go to one of David’s colleague’s house to eat some sha guo, which is David’s favourite food here. 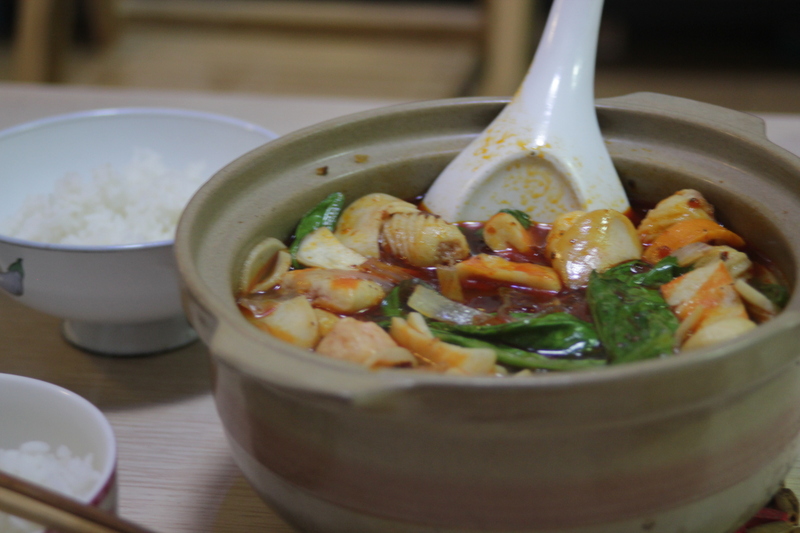 Sha guo is a soup that has tofu, tofu skin, mushrooms, meat or seafood, seaweed and lots of spice. As we arrived we had some tea and our host even conducted a Chinese tea ceremony. Tea does taste so much better here and there is such a huge variety. I recognise a lot of the teas here from back home. My mum and grandmas collect flowers and plants every summer, dry them and put them in the cupboard ready for the winter. Chinese mums and grandmas used to do that, but now the tea shop does it for them. It’s nice to have a piece of familiarity amidst this strangeness. We went to a German restaurant last night. I had a schnitzel and sauerkraut and David had some beef. It was the first ‘Western’ meal we’ve had since getting here (apart from Estonian vorstikaste made with Chinese sausage). Both of us were so happy. I think my stomach actually spoke to me and said thank you. Our Chinese is getting better and better. We can have small conversations, ask questions and make ourselves understood most of the time. It feels good to know we can master this language. I still find it difficult to understand what people say to me unless they slow down. 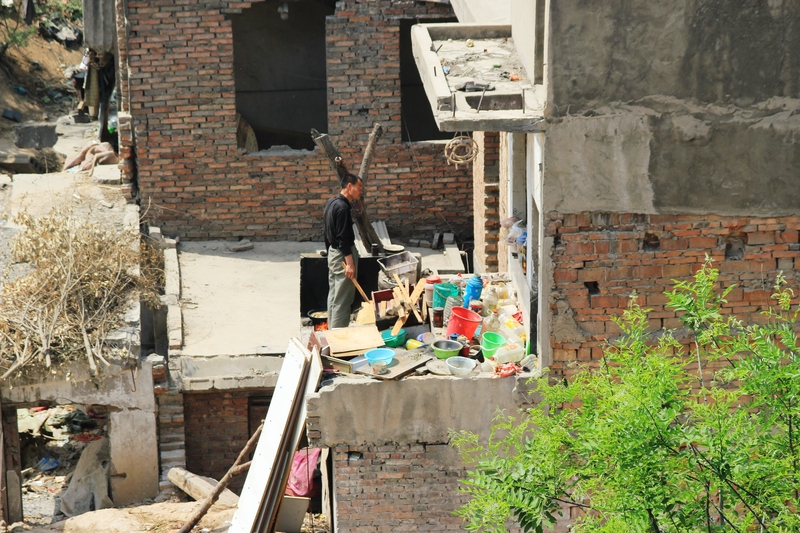 As soon as we start speaking with them in Chinese they speak to us like they would to another Chinese person, which is very fast and using local Xianese slang. Holiday starts in a week, I cannot wait to lay on the beach and do nothing. 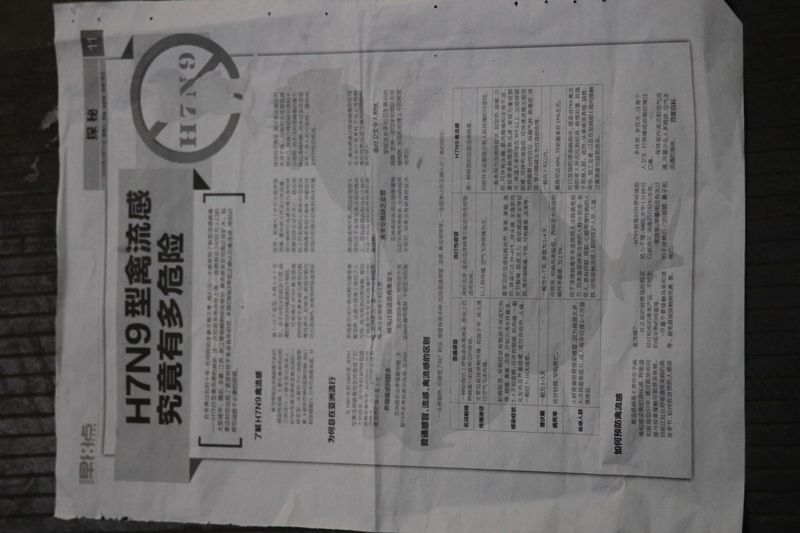 No bird flu cases have yet been discovered in Xi’an, but people and newspapers here are talking about it a lot. The Chinese staff at my school have all stopped eating any meat in the fear of catching the bird flu. They are very obsessed with germs and cleanliness, but the city is still generally dirty. Do you see the Chinglish? This is a huge advert on one of the new high-end apartment block areas,. Posted in China, PlacesTagged Buddhism, China, Chinglish, Xi'an, Xi'an city wallBookmark the permalink.